The story: One of my favorite things about French Polynesia is the omnipresent attitude of respect for the ocean and marine animals. It often seems to me as an underwater photographer that the marine animals return the favor! Because in French Polynesia, shark fishing and trade in all sharks is permanently banned, French Polynesia is one of the remaining places left in the world where numerous sharks can be seen together at the same time in their natural surroundings. As a photographer I really enjoy the idyllic lagoons throughout these islands where many sharks can be regularly seen including blacktip reef sharks in shallow waters. 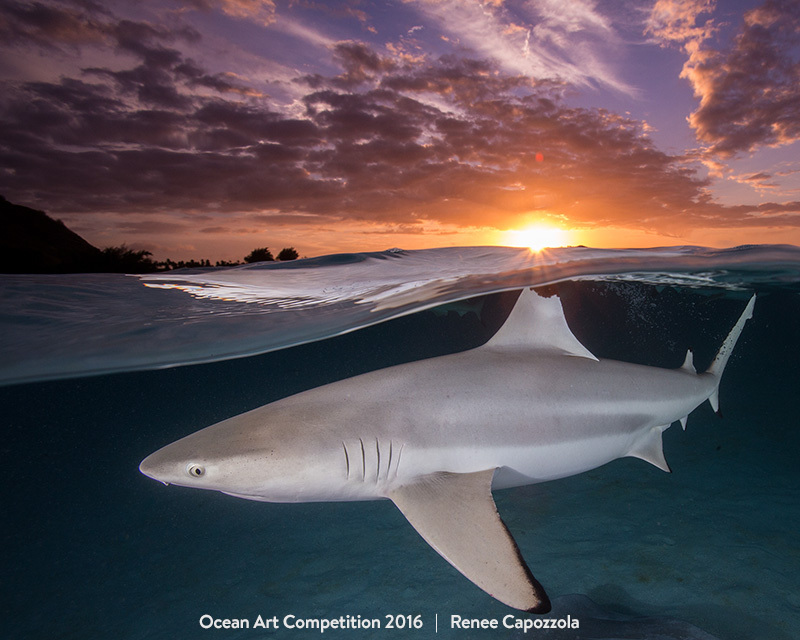 One evening, after spending much time with these blacktip reef sharks during the day, I decided to go back out at sunset to see if I could get an over-under. I was very fortunate, as when our boat arrived there were even more sharks than usual. After dialing in my camera settings, I quickly hopped into the water as the sun was setting to capture this shot. It is my hope that images like this, which portray these magnificent creatures in a beautiful setting, will help increase awareness of the added protection sharks need in other parts of the world." Camera: Canon 5D Mark III and Canon 16-35mm Lens (F18, 1/200, ISO 640) with Nauticam Housing and Sea & Sea Y-D1 Strobes.